A worthwhile alternative set of markings for the upcoming 1:32 scale Revell He 111. Revell’s upcoming 1:32 scale He 111 is a keenly anticipated kit. AIMS are aware of the release and have tried to get a jump on the opposition. They’ve already announced a set of markings for this aircraft and list an interesting selection of subjects. There are 5 options to choose from which are all found on a single decal sheet. He 111 P-2, “1G+EK” of 1/KG 27 “Boelcke” piloted by Lt. Scholtz in East Prussia. This aircraft was seen during the Polish campaign and sported the usual RLM 70/71/65 splinter scheme. The assumed spinner colour is red and the image of a “jester” helps add to the aircraft’s appeal. It’s not known for sure if “G1+KH” of KG 55 was a P-2 or H-1, this being due to the cropped photo of the original machine. It displays a white buffalo emblem on the fuselage side which was designed by 1 Staffel’s Hauptmann von Casimir. Again the standard RLM 70/71/65 pattern was used on the airframe. One of the more interesting tail markings seen on an He 111 was for “B3+BK”, Wk Nr 2497 of 2./KG 54. Lt. Horst Flick was forced to land this aircraft after being attacked by fighters on 19 May 1940 near Dunkirk. The fin sees a bomb-riding bird hovering over an unsuspecting hare, which is complimented by the unit emblem and white diagonal stripe. All this is painted over the RLM 70/71/65 finish. This He 111 P carries the badge of 8./KG 76 on its rudder and a mission tally along the side of the fuselage. KG 55 aircraft were involved in the night offensive against London and as such wore the illustrated temporary black finish over the usual RLM 70/71/65. “5J+CN”, Wk Nr 1526 of 5./KG 4 crashed in the Norwegian mountains on 26 April 1940. It happened after the aircraft was attacked by Skuas from No. 801 Sqn. following the bombing of the train station at Aandalsnes. RLM 70/71/65 covered the aircraft which is made a little more colourful with the red Staffel colour on the spinners. All of the items on the decal sheet were found to have perfect colour registration. The carrier film was minimal as well as being commendably thin. The instructions leave no doubt as to where everything should go and even provide some history behind each machine. Importantly, the manufacturers detail the references they have used for their decisions which allows the modeller to verify any conclusions for themselves...kudos to AIMS. 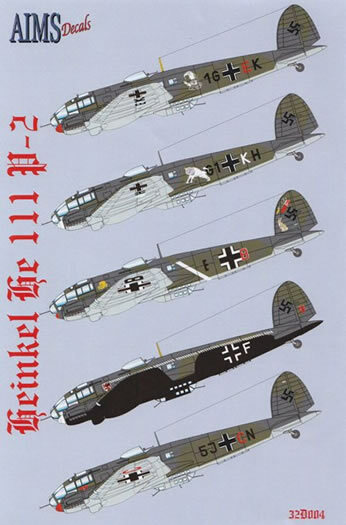 So if you are looking for a quality set of markings for the upcoming Revell He 111, this sheet should be in your sights.